The bells tolled early this bright Sunday morning, our last but busy day in Ecuador. The whole city goes to the many masses on the hour in each of the extraordinarily decorated churches. Humble families squeeze together in the pews. We set out with plans to visit seven churches within walking distance and by lunch time, Mary and I had heard the gospel read 4 times in Spanish, prayed the Lord’s prayer in Spanish, listen to 3 sermons in Spanish about the Reign of God and even Romans 7 about having discipline problems because the body wants to do what the mind knows is wrong. We sang Spanish songs I remembered from Uruguay, and saw each priest hold up the round holy wafer as he offered it before the Lord. Mary and I were tempted to share in the Eucharist with the supplicants, no one would know if we were Roman Catholic or Anglican Catholic, but something restrained us. Respect, I guess. Although we all say the same Creeds - about the one, holy, catholic and apostolic church - we could not share the Lord’s supper with each other - because the two of us were not Roman Catholic, and we have been divorced and therefore are in continual sin, - that’s what I was told in Uruguay by a Monsignor who didn’t like that a woman had been ordained to Holy Orders - and therefore it seemed we were not sufficiently clean to share the bread and the wine with the people. It hurts but orders are orders. So, we wandered down the huge aisles along the sides of the nave looking at the various statues of Christ and the Virgins of assorted sorts, which were adorned in petitions, flowers, and glamour and of course the enormous floor to ceiling ornate golden altars in the Baroque style (means over-kill in gold, silver, putti or cherubs, angels, animals,) and always in the cupola a reference to the Inca Sun God. We actually visited the churches/monasteries of the Franciscans, the Carmelites, the Dominicans, the Jesuits and the Merceds and finally San Augustinians. But first, across the street from our hotel stands a large church attached to a nunnery. On a balcony nuns were chanting behind a wooden screen, not connecting to those praying below. Depicted along the walls were worshiped saints I have never seen. 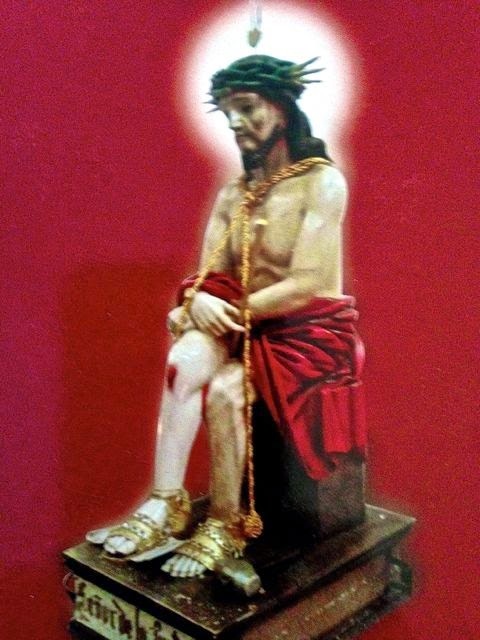 Most impactful was the Senor de la Justicia figure which shows Jesus in silver sandals sitting on a bench, (a mock throne), holding a cane, his head pierced by the crown of thorns, blood dripping down his face, his hands tied with a rope. The worried pray to this statue for mercy and just solutions to problems. There is also always a large statue of the winged Immaculate Virgin of Quito stomping on the serpent and unique in all my interest in Santos, icons and Christ and Virgin images, was a large wooden cross on which a very plain young woman in a long brown dress and bared feet had been crucified. We were curious as to who this was, because it was not Joan of Arc or any saint we had seen before. We were told it was a tribute to Regina, an Ecuadorian saint, but that is all we could find out, but it was shocking to see a young girl crucified. 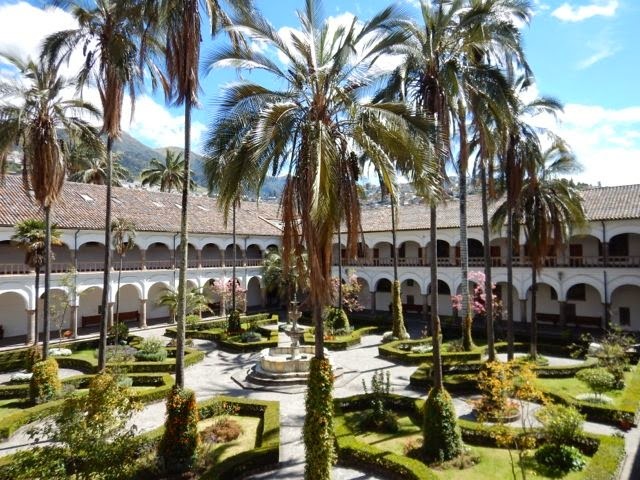 The huge cobblestone Franciscan square (with no benches, flowers or sculptures in it) where in the past plays and bullfights were held, is the heart and soul of Quito. 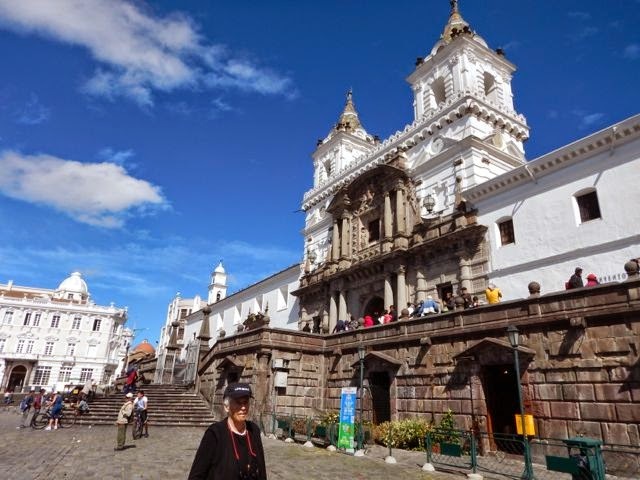 The poorest and humblest people enter the giant doors into the golden heaven beyond, one of the most ornate Baroque churches in South America. There is a legend about the Quitenos stonemason and the devil, the one trying to finish the square, the other trying to stop it from happening, with the devil actually finishing the job for the stonemason but leaving one stone unplaced (by accident) that invalidated their pact so the stonemason would not have to endure the tortures of hell. Well, it’s a legend. The pulpit features the three enemies of Catholicism - Luther, Calvin and Arius, carrying on their shoulders for eternity the weight of the one true Church. The interior is ornate with its Renaissance-styled mirrored side altars, the Colonial-Romanesque stone columns, and a Moorish choir ceiling and the ample Baroque gold leaf and often gaudy sculptures and Medieval murals are awesome but the Fray Pedro Gocial museum is extraordinary and is found in the hallways around one of the many huge very simple palm filled courtyards where peace and prayer fill the air. 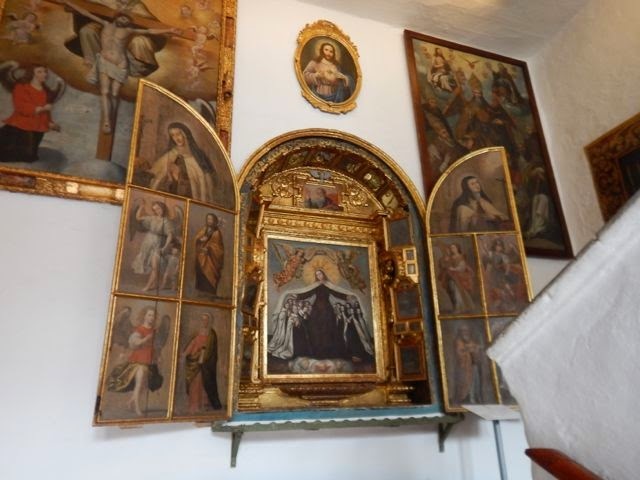 On another corner a real find was the Museo del Carmen Alto in the Monasterio del Carmen de San Jose and Santa Mariana de Jesus, Ecuador’s only true Saint. 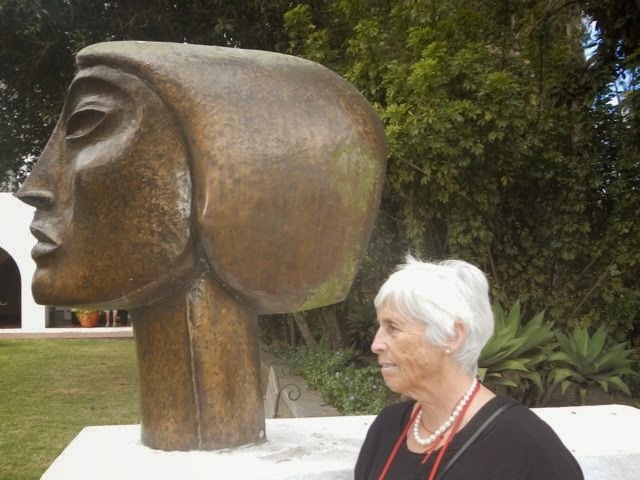 It is the order of the Carmelites of Quito and 21 nuns are in constant prayer for us and the world. The monastery was built in1653, but the first class museum has only been restored and open to public a couple of days, when we happened to go up the stairs to see what it was. The images and art work in the museum planted visuals in our souls that we’ll never forget. Sadly, no photography is allowed in any of the churches during the masses, so I can’t share their beauty with you. Mariana de Jesus was a self flagellating nun who died at age 26. In a setting in the museum, she is laid out on her bed surrounded by all who were at the Last Supper (but the good Judas), two angels and two women whose names I wrote down but cannot read. 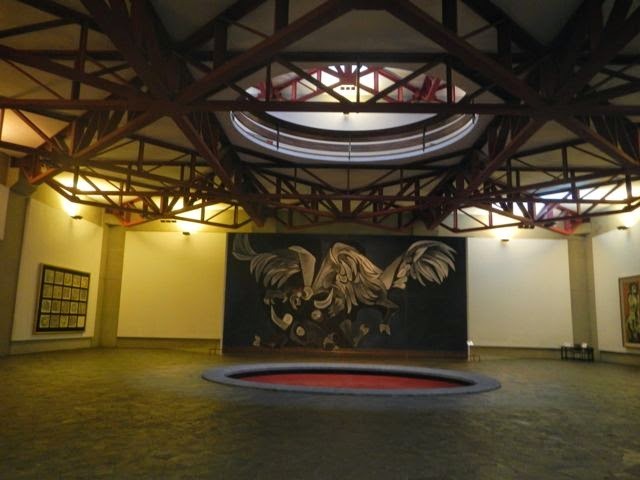 This museum with three floors of scenes and galleries was a miracle. Considered one of the most beautiful Baroque churches in the Americas is La Compania de Jesus. It took 160 years to make it what it is today even though for a time it was left to rot. It has an artistic case of Horror Vacui (horror of space), which is an obsession to fill every last nook and cranny with decor and excessive symbolism such as fertility and joy represented by vines and grapes; open pomegranates for Jesus crown of thorns; seraphims and cherubims to attach the Compania to Heaven. To sit under all the ornate tribute to our Lord is moving. 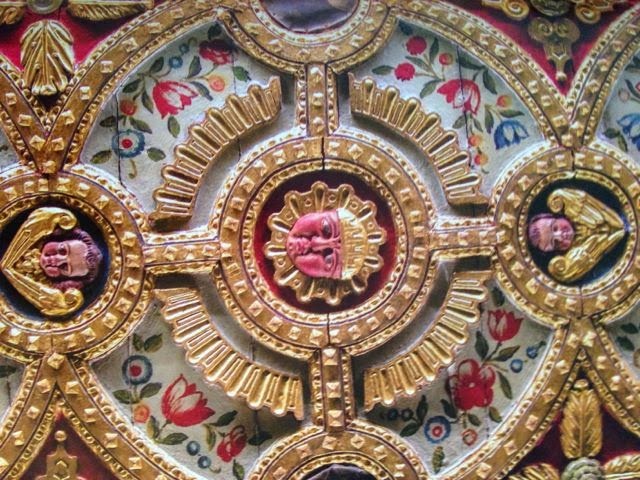 On the ceiling of the Church of the Dominicans, the story of Jesus is told through the sacred heart - instead of the figure of Jesus occupying the places he normally would, there is just the Sacred Heart. Here, as in other churches, the most shocking visual was the use of real human hair on Mary and Jesus and other Saints. Apparently it is an honor to have your hair used in this way, after your own death, of course. One artist had tortured his model so that he died, and then he took his skull, added some clay, and put it on one of the Jesus statues. 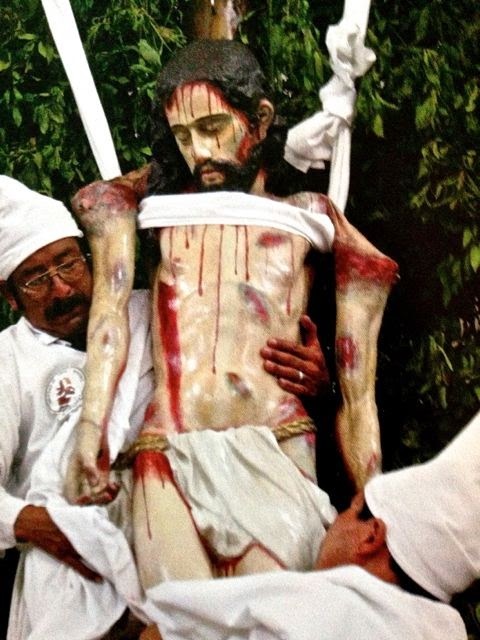 What I had not been familiar with (and trust me, I’ve been a pilgrim of religious art all over the world) is that on crucifixes and other statues of Jesus, look at the back - you see the skin so lashed it is hanging, and blood running down his back. 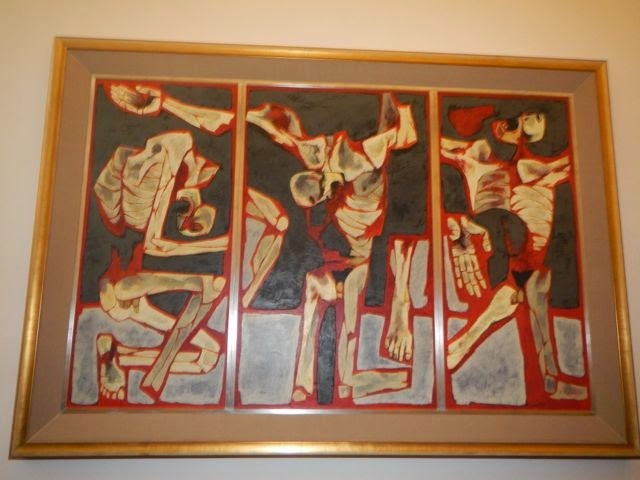 Showing the blood on the back and on Jesus face is big time here in Quito religious art. In one of the churches (I cannot remember which), females carried the gospel book down the aisle and were assisting at the altar, although they were acolytes. But that’s a start. I also learned why people named Joseph are called PePe. The Ps stand for Putative Padre - which is when a Father is not the biological Father, as in Joseph, the putative Father of Jesus. Putative Fathers are part of the conflict in Foster Care Reviews. 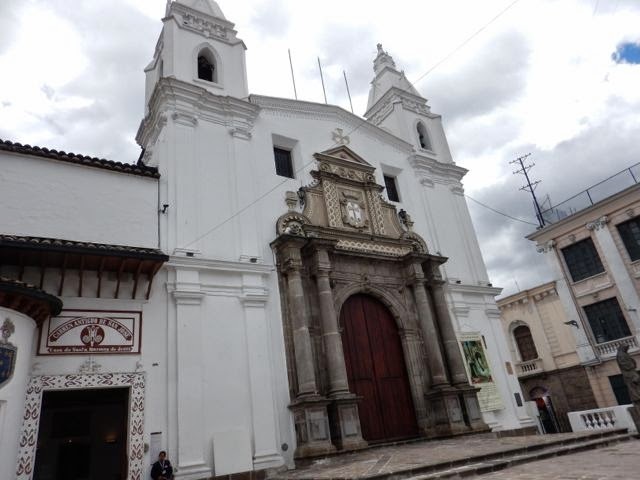 We also visited the Church of La Merced where the Virgin of the Volcano is honored. Less ornate, its ceilings were still havens of pink and blue and gold. It is a quite gem of the great team of embellished tributes to Christ and the Saints that are around every corner in this city. My favorite church was the last one where an African priest held sway and his sermon was sensitive and moving, unlike others which were rather monotonous in tone and crisply dictated. 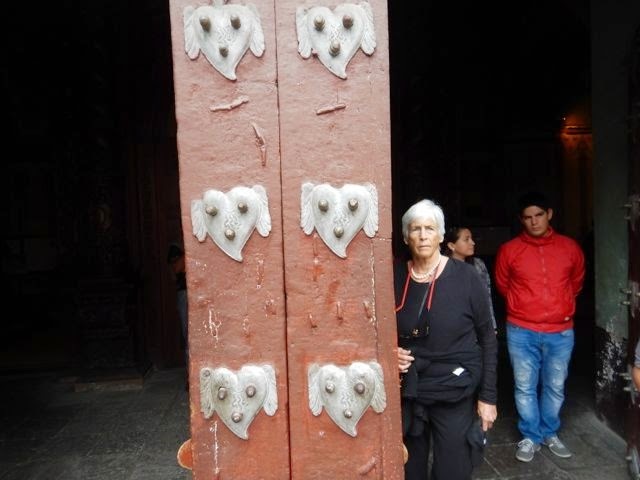 The Church of St. Augustine in Quito grabs your attention with it’s huge doors and they were opened so we went in. This felt more like home, but just as ornate as the other churches. 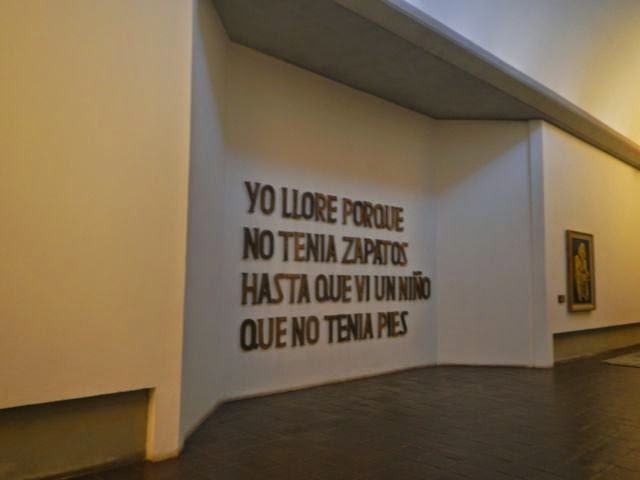 It is dedicated to El Senor de la Buena Esperanza (The Jesus of Good Hope). 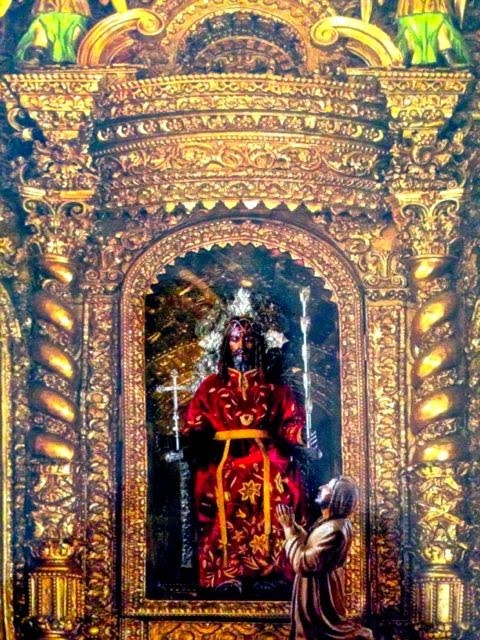 The central sculpture of the Altar is the figure of this Jesus in a red robe with a wired corn of thorns and the silver sandals again, similar to the Justice statue. Strange to me was his silver crown from which three large silver fans arose representing, I gather, the Trinity. 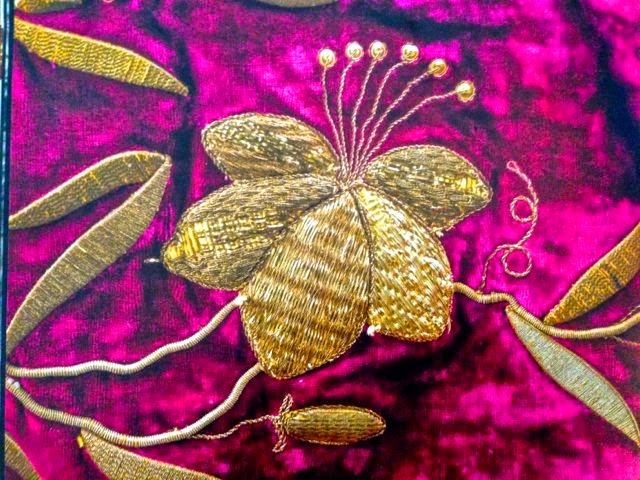 And a display of amazing velvet robes highly ornate with embroidery showed what the people dress on the figure of El Senor de la Buena Esperanza when he is paraded through the streets on his Saint day. This was our final morning stop for prayer and adoration for our God. 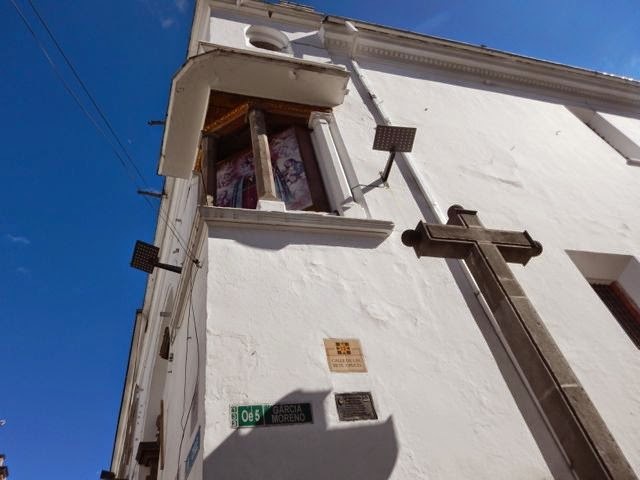 After all this religiosity, we wandered into the quaint district Calle de la Ronda, where there are shops and people dance in the streets and enjoy life. 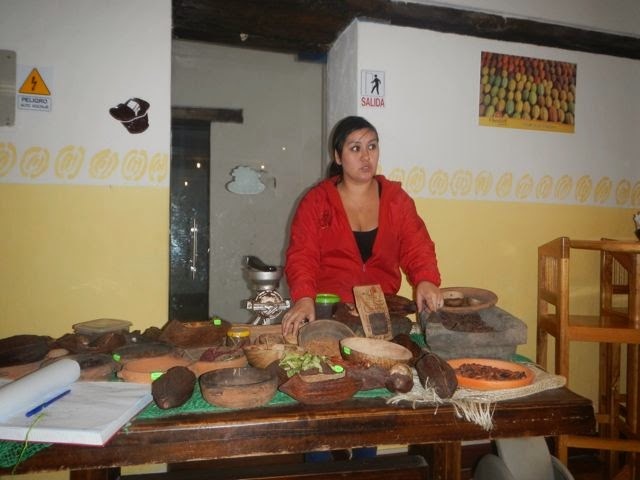 We stopped for a chocolate tasting - and please understand, Ecuador makes the best chocolate in the world, most of it exported and used under popular brands. In this tiny shop, dark chocolate reigns - and we were given an idea of how chocolate is harvested and prepared for our savory enjoyment. We tried 100 per cent dark chocolate with no sugar or butter or additives, the chocolate which is beneficial to our health. It was delicious. So now I believe a chip of 100 per cent dark chocolate a day is a way to keep healthy. We tried truffles filled with blackberries (in season now), passion fruit, macadamia nuts, and little coins with ginger or salt on them. A good meal. I’m convinced. until I see he doesn't have feet. 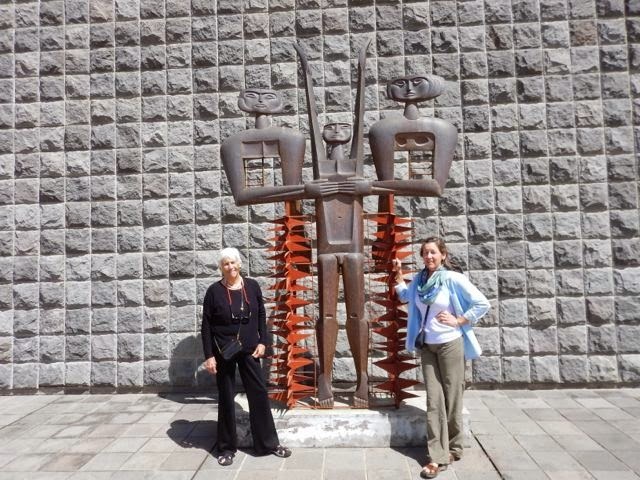 We said farewell to the warmth of Quito’s spiritual heart and cerviche, potatoes, popcorn and corn nuts, which we seem to eat every time we sat down for a meal. We’ll be back, I’m sure, God willing.